The primary component of TurboGen™ is a self-contained turbo shaft engine. The engines mechanically-free power turbine drives an electric generator. The system is expressly designed for energy conversion research and education. To compliment the impressive hands-on hardware, TurboGen™ features an extensive sensor suite, National Instruments Data Acquisition System, and LabVIEWTM Interactive Virtual Instrument Panel, which allows for real time monitoring and recording of sensor data. The TurboGenTM Interactive Virtual Instrument (VI) Panel is a high-powered extension of the system’s main operator control panel. This LabVIEWTM generated VI offers a real-time graphical cutaway perspective of the system operation, which allows operators to “look inside”. All system operating parameters are displayed as they occur with system locations clearly indicated on the cutaway graphic. Pressures, temperatures, fuel flow, voltage, current, and power parameters are displayed in numerical display windows. Turbo-shaft engine and generator RPM are displayed on analog-style round meters for a neat visual cue. (The readings are also displayed digitally below each meter). The real-time plotting feature lets the operator plot any parameter on screen as it occurs in order to provide a clear sense of how the data is reacting to the actual system operating conditions. Operators can toggle between all the parameters to watch them graphically. Data logging functionality is conveniently controlled from the VI screen. 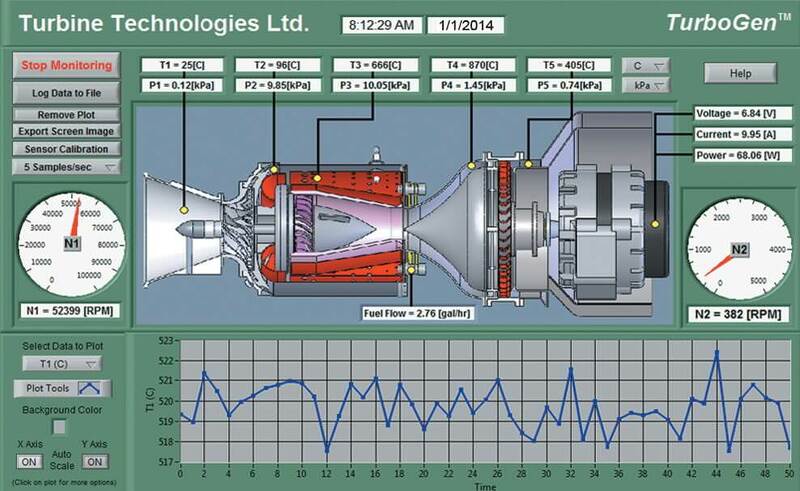 All the jet engine power data can be observed and tracked as it affects the electric generator data. System units can be changed with a simple click of the mouse. Feeding this interactive VI is data from the on-board National Instruments 6218 Data Acquisition System. That same data is also stored on the included laptop PC for later retrieval and analysis. Researchers and students alike will find TurboGen™ easy to operate while providing extensive performance capabilities. The engine is fully throttle-able while the free turbine can be loaded over a wide operational range (by varying generator load) giving researchers and students a broad, combined, study bandwidth. TurboGen™ features many innovative operational sub-systems including a fuel-cooled alternator, exhaust powered cabinet cooling fan, integrated resistive load element, and custom speed tach generators. TurboGen™ comes standard with unsurpassed factory-direct support. If you demand more than virtual reality for your gas power research or educational lab, TurboGen™ is as real as it gets. Energy relationships and the First Law of Thermodynamics. Cycle analysis and the Second Law of Thermodynamics. Cycle and component efficiency studies. FEA & CFD analysis via available component CAD models. Airfoil velocity vector diagram construction. Experimental and data acquisition technique. A complete micro turbine genset to consist of an engine/generator combination designed and manufactured specifically for engineering education. Engine must utilize an axial flow turbine stage, a reverse flow annular combustor, a free power turbine stage and a centrifugal compressor stage. System to include a USB connected laptop computer interfaced with National InstturmentsTM hardware and customized LabVIEW™ VI displays. System sensor package to entail 15 data reading points to include compressor inlet temperature and pressure, compressor stage exit temperature and pressure, turbine inlet temperature and pressure, power turbine inlet temperature and pressure, power turbine exit temperature and pressure, fuel flow, engine core RPM, power turbine RPM, generator current and power. Complete system not to require permanent facility modification or additions. Complete genset to be mounted behind transparent protective shields allowing clear view during operation. Fully automatic engine start and operational health monitoring system provided with LCD status readout and cumulative run-time cycle count. While developing the TurboGen™ Gas Turbine Electrical Generation System, Turbine Technologies, Ltd. determined their most ambitious educational lab system design to date should feature the latest onboard data acquisition and virtual instrument panel systems. 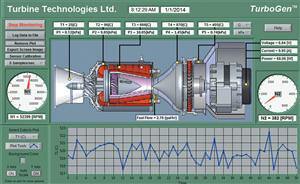 Turbine Technologies, Ltd. (TTL) has introduced the SprayView™ Fuel Atomization Verification System. The Turbine Technologies PT-50 turboshaft engine offers a new heavy fuel solution for UAV’s requiring a 50 HP class engine. Turbine Technologies will be unveiling its PT-50 turboshaft engine in San Diego at the Association for Unmanned Vehicle Systems International.